A sure sign of spring for us is when the farmer’s market opens up outside. Despite the overcast skies and two women “entertaining” us with folk songs there was an energy in the air and a happiness to see everyone again. The market had loads of local meats that I snapped up for future dinners. Fresh chicken isn’t in season yet, we’ll have to wait a few more weeks but I’ll be stocking up as I need the bone for chicken stock. Our dogs were super excited to head over there. They remember the smells, the water bowls, and if they are lucky the dog treats. They are more than happy for me to take my time figuring out what to buy. There is one booth that loves dogs. The woman loves to take pictures to post on her Facebook page. I think there are more pictures of dogs than her chutney! I came across a recipe for chicken skewers that used honey, siracha, and lime. I thought this would be perfect for a salad. This is my take on that recipe. The prepping and the cooking is less than half an hour. How long you marinate for is up to you. 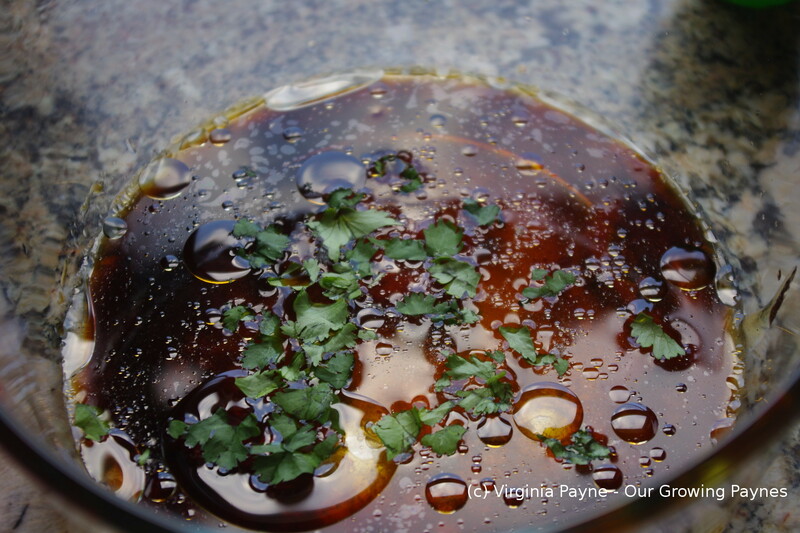 For the marinade I added 1 tablespoon of vegetable oil, 3 tablespoons of low sodium soy sauce, 2 tablespoons of honey, a couple of tablespoons of lime juice, 2 tablespoons of siracha sauce, salt and pepper to taste, fresh chopped cilantro, and some red pepper flakes. The recipe called for garlic and I spaced on that. Next time I’ll add some. Mix it well then add the chicken breasts to marinate. 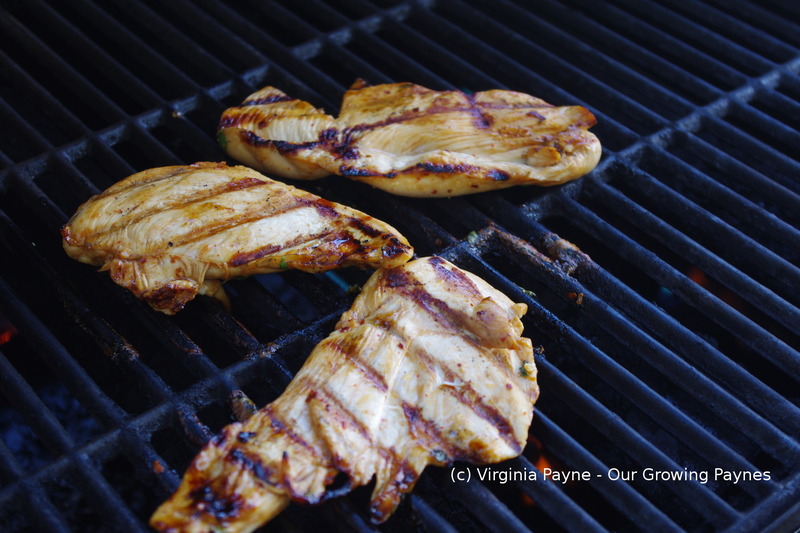 When you are ready to put everything together fire up the grill and grill the chicken. I threw together a quick salad of greens, bok choi, tomatoes, cucumbers, and peppers. 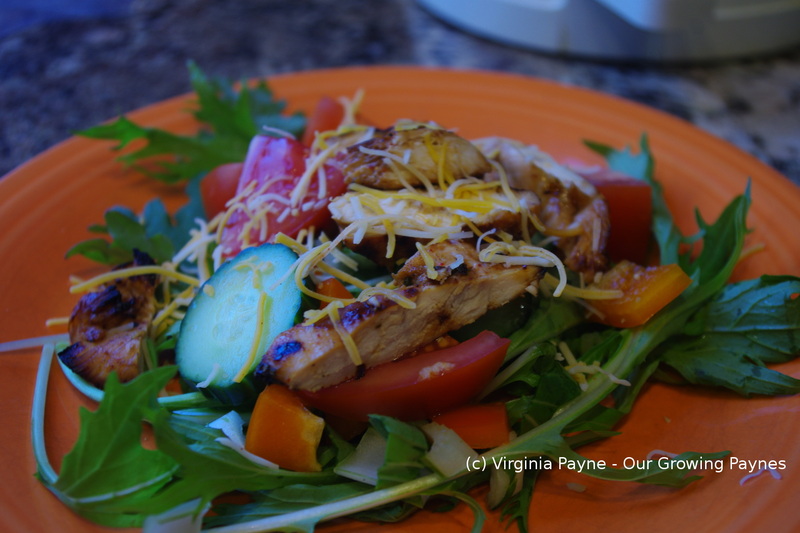 When the chicken is done slice it and top the salad with it and a bit of shredded cheese. I did up a quick dressing of olive oil, lime juice, cilantro leaves, siracha, salt and pepper. The bit I would change is to add more siracha and red pepper flakes. The marinade itself had heat and I didn’t want to scorch the kids but once cooked it wasn’t as spicy. So I would dial it up so we’d get more of that on the chicken. This entry was posted in Asian Recipes and tagged chicken, cooking, dinner, food, grilling, lime juice, red pepper flakes, salad, salt and pepper, siracha, soy sauce, tomatoes. Bookmark the permalink.